Yesterday morning, I fished the Wild Ammonoosuc River with Colby and Justin. This tributary of the much larger Ammonoosuc River has historically been panned for gold for many generations and still is to this day. 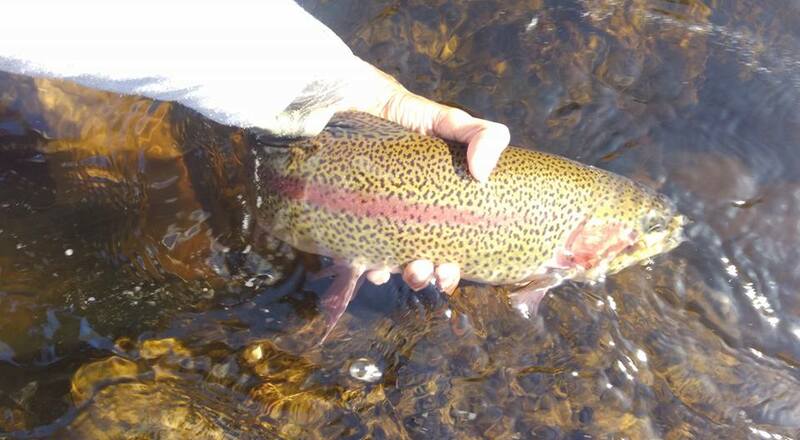 For that reason, it is overlooked by most anglers for other local streams such as the Pemi. and Mad rivers although it supposedly has a decent population of brook trout of its own. Of course, we decided to prospect and see what we else could turn up other than gold from this overlooked gem. Justin and Colby got there Saturday afternoon and camped for the night but I couldn't join them until early Sunday morning since I was working. To my surprise, they were still fast asleep when I got there at 7 which was odd since I knew them as early risers. While they were getting ready, I went downstream a ways and worked up. I started off nymphing but the fishing was really slow in the morning. I worked all likely looking areas and bounced bottom but didn't turn anything, even in a couple really good looking pools. I didn't even see any fleeing shadows, which is usually a dead giveaway of fish in these gin clear waters. I had a couple of bumps that felt suspiciously like fish but that was it for action. By the time I made it back to camp, the sun was higher up and Colby and Justin were preparing breakfast. I told them about my lack of success and Colby steered me to an unnamed feeder creek near by where they had luck the previous night. At first, the creek did not look like much but I found a nice, gin clear slow moving hole nearby that was chock full of brookies so on went a dry fly. Unfortunately, the sun was beating down on this pool making it so that if I got too close, my shadow would spook anything in sight. I stood back far enough and went to work. My fly wasn't getting any attention until I started twitching it, then just like that, these seemingly uninterested brookies became complete savages, fiercely striking my fly, sometimes more than once! I caught a half dozen before they started realizing something wasn't quite right. After that, I switched over to sight nymphing a soft hackle pheasant tail and got a half dozen more including the largest fish in the pool! I went back to camp excited but found that Colby and Justin were gone so I went upstream, assuming I would catch up with them. I switched back to nymphing and started to work my way upstream. I fished up over 100 yards of river without a single strike! I didn't even see any fleeing shadows and I deliberately walked through some decent holes after fishing them so see if I could spook anything but nothing doing. I fished up to a fork in the river but before I decided to turn around, I spooked a couple fish in the slower arm. Ok, at least there were fish in this river so I decided to continue for a little longer which turned out to be a great decision. I found a nice pool with a log jam in the tailout (possibly created by a beaver), creating a sort of back water. Here, I caught at least a half dozen fish on dries and missed many more strikes. It didn't matter what I did, I got them dead drifting and skittering my offering and even landed a few that were sitting near logs in the backwater. Suddenly, my luck seemed to change on a dime. I continued to get fish on dries as I worked my way upstream, suddenly in more typical areas I would expect to get fish (pockets, runs, and undercuts). I felt no need to go back to nymphs for the rest of the day so I kept the dry on. For the most part, many of the fish I was getting were near wood cover of some sort. Eventually, I reached a nice gorge area where I took 3 more fish before turning back. I got some more fish working my way back downstream to the beaver pool. I only managed one more in the "fish less" stretch from earlier in a shallow run that I skipped over. By the time I was getting ready to head out, I caught well over a dozen fish. I got back to camp to find it abandoned so I figured that Colby and Justin had gone downstream instead. When I got back to my car, I got a note telling me to meet them at Beaver pond up the road in Kinsman notch. Overall, I had mixed feelings about the Wild Ammo. The fish averaged 4-6 in., with many closer to 6 in., so they were on the larger size for mountain streams but there weren't very many of them. Many stretches of pocket water (B water) seemed to be devoid of fish despite the decent looking holding water. The areas that I seemed to find fish were larger and deeper pools and runs (A water). This was a stark contrast from the Ellis but it may have been due to the fact that the Ammo was smaller in size. Whatever it was, I was glad to have persisted and found some good fishing further up. I eventually found Colby and Justin at Beaver Pond. They reported far less success downstream but said that the seemingly fish less stretch produced some fish yesterday (weird, right?). Justin ruled the roost over at the pond, catching around a dozen brookies and Colby caught around six all on dries. I caught a whopping zero, losing 2 fish. It was a short trip ruled by wind knots and frustrating line twist. Oh well, you win some and you lose some. I'll spend more time fishing ponds in the future.